Oh boy oh boy oh boy oh boy oh boy! 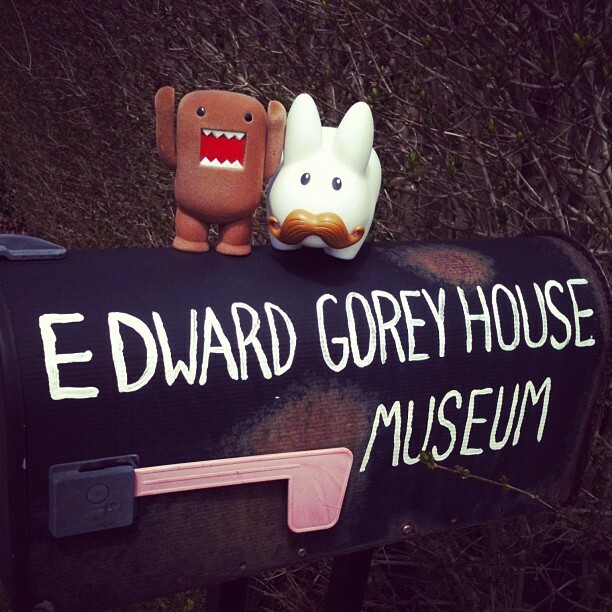 Domo and Pipkin have arrived at 8 Strawberry Lane, Yarmouth Port, MA, the home of the late, great, Edward Gorey, also known as The Elephant House. Back in December, Pipkin had the pleasure of visiting the Portland Central Library in Portland, ME to catch the Elegant Enigmas exhibit. Along with a gallery of Gorey's work, Pipkin saw a few plush creations the artist had sewn (he made toys! ), a lot of sketchbooks and letters, and early work Pipkin hadn't seen before. 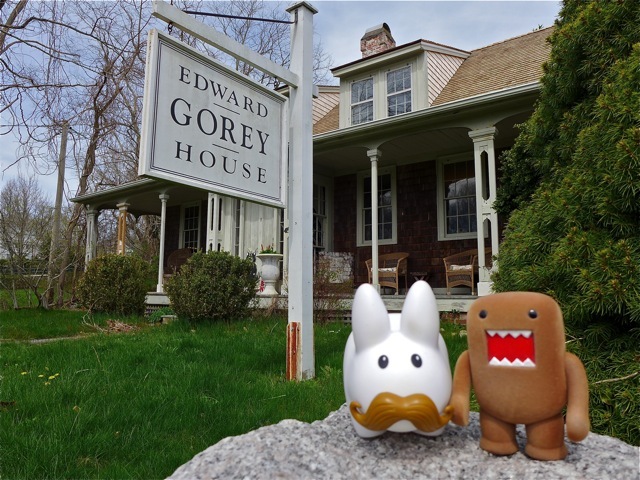 Domo didn't join Pipkin on that trip so he missed out on the exhibit, but he's more than making up for it today at the Edward Gorey House & Museum! 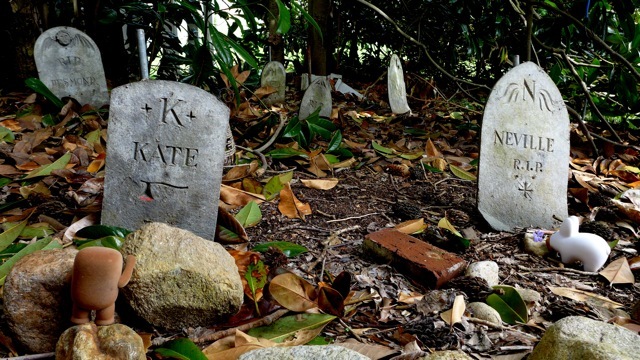 When Edward Gorey passed away in 2000, his house became a museum dedicated to his life and work and his devotion to animals. Proceeds from admission go towards the Tufts Veterinary School, the Bat Conservation International Foundation in Austin, TX, the Animal Rescue League of Boston, and the Xerces Foundation in Portland, OR. 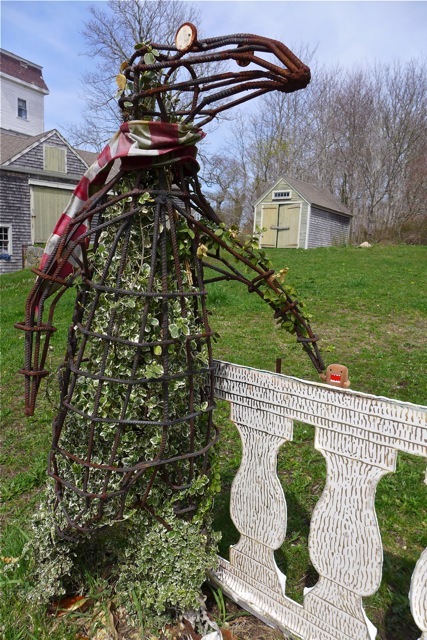 The duo were greeted by this Doubtful Guest topiary. It's early spring so he hasn't quite filled out yet. Surely as he sits down (uninvited) to more dinners, he'll fill out some more. Before they headed inside, they explored the grounds. 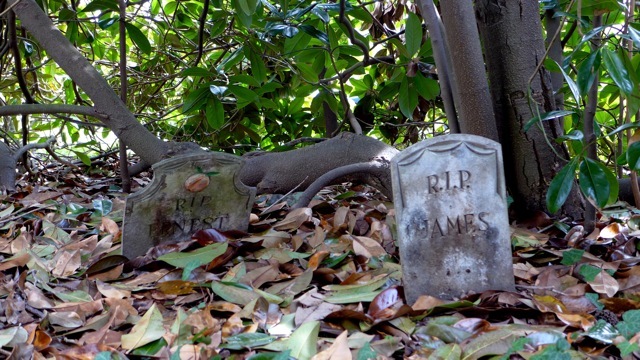 They began in the backyard, where they paid their respects to the Gashlycrumb Tinies, gathered underneath a magnolia tree. 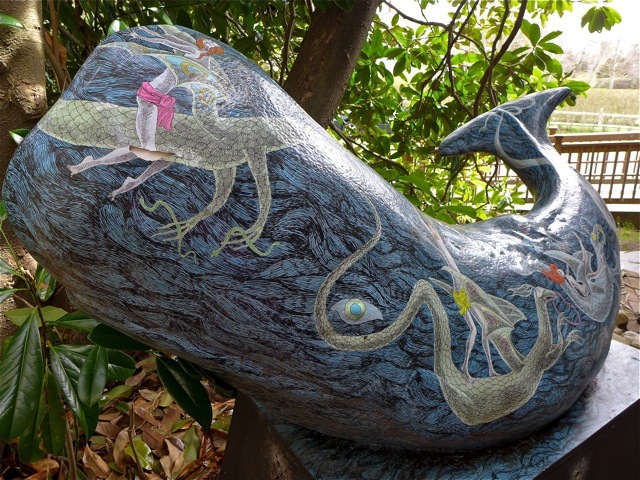 In the Gashlycrumb graveyard there is a Cape Cod whale (part of the Cape and Islands Whale Trail) painted with images from Edward Gorey's Witches and Warlocks. 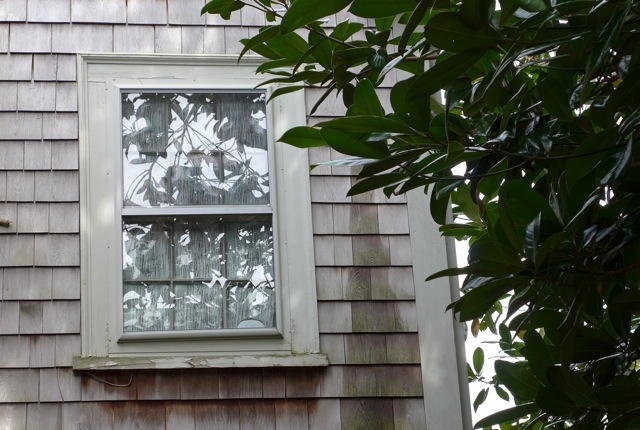 Up in a window, you can see an homage to Neville (who died of ennui). It's hard to see his eyes from outside because the window is so high, but you get a better view of him from inside the house. 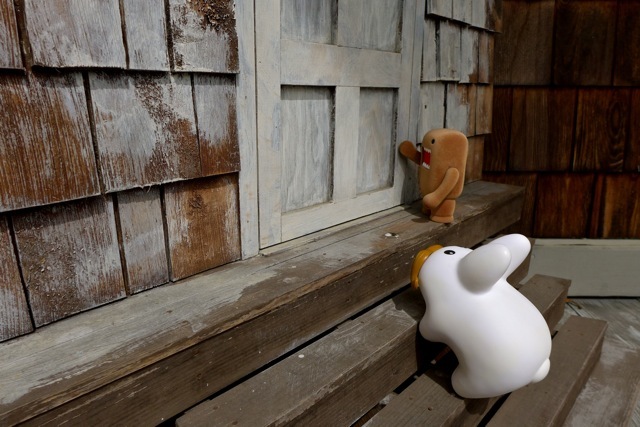 After a short break relaxing on the chairs on the porch, Pipkin and Domo headed inside the house. 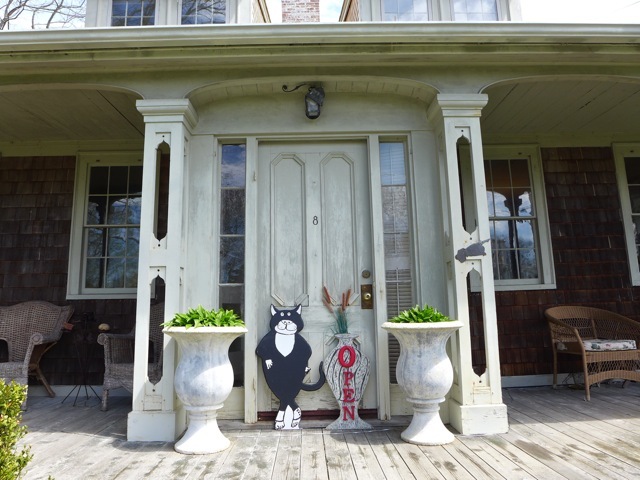 Please come back to read Part II of their trip to the Edward Gorey House!